As I laid out here, Trey Gowdy spent much of Monday’s Russia hearing talking about how, if someone reveals details of FISA collection, that person has violated sacred trust and also committed felonious leaking. House Intelligence Chair Devin Nunes was present for some, if not all of Gowdy’s tirade. At our open hearing on Monday, I encouraged anyone who has information about relevant topics—including surveillance on President-elect Trump or his transition team—to come forward and speak to the House Intelligence Committee. I also said that, while there was not a physical wiretap of Trump Tower, I was concerned that other surveillance activities were used against President Trump and his associates. I recently confirmed that, on numerous occasions, the Intelligence Community incidentally collected information about U.S. citizens involved in the Trump transition. Details about U.S. persons associated with the incoming administration—details with little or no apparent foreign intelligence value—were widely disseminated in intelligence community reporting. I have confirmed that additional names of Trump transition team members were unmasked. To be clear, none of this surveillance was related to Russia or any investigation of Russian activities or of the Trump team. I’ve asked the Directors of the FBI, NSA, and CIA to expeditiously comply with my March 15 letter, and to provide a full account of these surveillance activities. I informed Speaker Ryan this morning of this new information, and I will be going to the White House this afternoon to share what I know with the President. Nunes said he saw dozens of reports and that the information he saw has nothing to do with Russia or the Russia investigation, or any discussions with Russians. Nunes then said he was headed to the White House to tell Trump which, if there is any legal interest in any of these intercepts (as there might be if they pertained to Mike Flynn’s communications with Turkey, for example), then Nunes just committed obstruction of justice. “It’s all classified information,” Nunes explained. And Nunes so lacks any self-awareness, he seemed completely oblivious to the ways he had violated everything the Republicans were wailing about on Monday. Reporter 1: Do you think right now the NSA — or a member of the intelligence community — was spying on Trump during the transition period? Nunes: Well, I guess it all depends on one’s definition of spying. Clearly it bothers me enough, I’m not comfortable with it. Reporter 2: But you think he might have been spied on? Nunes: I’m not going to get into legal definitions here, but clearly I have a concern. https://www.emptywheel.net/wp-content/uploads/2017/02/Screen-Shot-2017-02-27-at-12.48.16-PM.png 539 915 emptywheel https://www.emptywheel.net/wp-content/uploads/2016/07/Logo-Web.png emptywheel2017-03-22 15:16:292017-03-22 15:35:51Devin Nunes Commits "Felonious Leaking"
Rep. Nunes’ D.C. office has a separate voicemail box for IC questions. It’s full, won’t accept messages. Nah, mailbox isn’t full. They’ve got a twit filter and it caught you. Rhetorical, is POTUS–as we comment–declassifying everything Rep. Nunes leaked? Will Rep. Nunes petition DOJ to drop charges against Edward Snowden? As I was watching Nunes blathering on during his time on camera, I was yelling at the TV “This is LEAKING! You idiot! !” Thanks for confirming what I witnessed. Only Democrats are allowed to leak names on FISA warrants! What was he thinking! This is a problem with these investigations. We all agree there was a need to look/listen hard at as many people in the Trump/Russian circle as a judge would allow. One inevitable (predictable, desired) result is the incidental collection of lots of chit-chat by Trump and associates. If that all adds up to something, score a win for Truth and Justice. But if it comes up empty, you are left with the sort of reports Nunes is apparently looking at – chit-chat going nowhere and what looks like gratuitous spying (however defined) on the transition team. Sort of a variation of “If you strike at the king…” – if you spy on him you better get the goods. All this would be much less of a problem if there were figures in Washington with bipartisan trust. 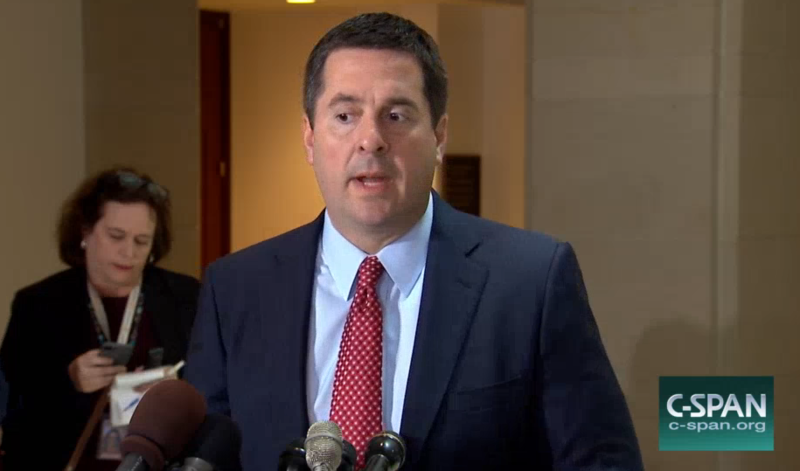 I’m pretty sure Nunes is not that guy. Pre-Monday polling showed Dems disliked Comey even more than Reps, although that is in flux. Nah, this stuff got collected (and did, with Obama) outside of the investigation. It’s normal stuff. It’s just that the guy overseeing all the this dragnet didn’t know that. I’m not sure what you’re trying to say here. Nunes finally bought a vowel and learned what ‘incidental collection’ really means, *OR* he has just leaked different info and possibly is trying to block an ongoing investigation. Maybe both cases are simultaneously true. Maybe trying to deflect attention. Maybe some of the leaks are from Congress? Today, Chairman Nunes shared information with WH still withheld from our committee. He cannot conduct a credible investigation this way […] Because the committee has still not been provided the intercepts in the possession of the Chairman, it is impossible to evaluate the Chairman’s claims. It certainly does not suggest—in any way—that the President was wiretapped by his predecessor. This is why Comey briefed him separate from Schumer, et al, he knew the second he knew he would obstruct justice. I am still waiting on one example showing that right-wingers are not completely above the law. I didn’t expect it to come this administration, but it looked like there might be a miniscule chance. Last week, KrebsOnSecurity received an email from eBay. The company wanted me to switch from using a hardware key fob when logging into eBay to receiving a one-time code sent via text message. I found it remarkable that eBay, which at one time was well ahead of most e-commerce companies in providing more robust online authentication options, is now essentially trying to downgrade my login experience to a less-secure option. They usually use some sort of distraction technique. Maybe they think they can set the tone for the drip drip of leaked reports coming. Perhaps the point is that there is nothing there, much ado about nothing. It would help (in the short term) to pull the lid off of water cooler talk and say, here look what hides under every rock that Comey turns over. Going to be difficult to sleep tonight. This gets worse by the hour. A leak is a leak is a leak. How long have you worked for Rep. Nunes? How many messages got past your filter? How many were supportive of Rep. Nunes? Tsk tsk, inane and wrong as usual twit. Imitation is the sincerest form of flattery. Ready to call it a day and quit this foolishness? I am. Nunes said the information was classified, but he argued that disclosing the existence of the report and the nature of it did not reveal any classified information. Note Swalwell is misinformed or just leaked or Comey was being ‘least untruthful’. Federal Criminal investigation. Probably all are true. But the criminal investigation is likely really happening in spite of media spin. Note that Peter King may have inadvertently leaked too. There is so much going on, so many stories, so much ‘classification’, that they all have trouble keeping track of what is supposed to be classified. Maybe all of Congress should not be compartmentalized (committees). Maybe all of the ‘intel’ should be available to everyone in Congress. Maybe then Congress could do their job. The Gang of 8 is antithetical to freedom. Maybe his panic attack stemmed from finding his name in that group! My working theory is that using the word “unmasked” is all teamTrump ploy. Thinking they are going after as many people as possible as close to Obama as possible. I mean Trump, ( pit bull, Michael Cohen? ) denies sending letter to teenage girl who made a kitten “punch/scratch a Trump” website? It seems pretty obvious to me that there is a difference between leaking information to the public, and leaking information to a friendly reporter who will write a biased story based on that leaked information..
Nunes need not have been literally “named” if he recognized familiar event patterns. He could simply discern identities from behavior, conflating conduct with being unmasked. Juicy enough to pass as unverifiable agitprop against the ghosts of the past. The silver lining, if any, might be more inadvertent transparency regarding TeamTrump conduct.